Maureen Walton Murals near Toronto, ON is a Custom Building Mural Artist that specializes in Hand Painted Wall Murals. 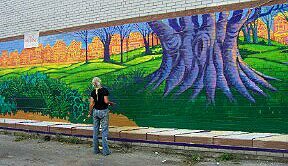 Maureen Walton near Toronto, ON is a Muralist Painter offering Building Wall Murals. Contact our Mural Artist today! Maureen Walton is a Fine Art Muralist near Toronto, ON that specializes in Art Gallery Murals and Outdoor Murals! Maureen Walton is a Mural Artist in Toronto ON that specializes in Kids Wall Art, Childrens Space Room Murals and more! Maureen Walton is a Mural Artist near Toronto Ontario (ON) offering Dental Office and Hospital Murals. Maureen Walton Murals in Toronto ON in a Museum Mural Artist that paints Huge Murals for the Art of Visual Storytelling. Maureen Walton Murals in Ontario is a School Mural Artist specializing in Custom Art and Wall Murals for Schools. Maureen Walton Murals in Ontario specializes in Nursing Home Murals for a Spiritual and Calming Wall Mural display.